With 85mm primes considered in Part 1, we’re considering here telephoto prime lenses ranging in focal length from 100mm to 200mm. Perfect for lots of subjects, including studio, fashion, weddings and events, these primes boast fast f/2 or f/2.8 apertures, together with a focal length that compresses perspective and enhances shallow depth-of-field for beautiful portraits and background bokeh. We’ve tested six 100–200mm telephoto prime lenses on the EOS 5DS R, with scores ranging from a high of 48 points for the Carl Zeiss Apo Sonnar T* 2/135 to a low of 29 points for the Canon EF 135mm f/2.8 Soft Focus. 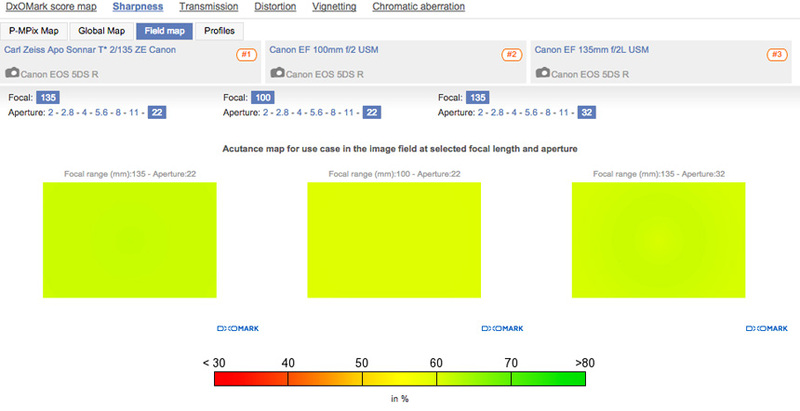 With an overall DxOMark Score of 48 points, the $1822 Carl Zeiss Apo Sonnar T* 2/135 is the highest-scoring lens we’ve tested on the 5DS R. It also ranks second overall for sharpness, thanks to its score of 41 P-Mpix that really makes the most of the 5DS R’s 50.4Mp sensor. Shooting at apertures between f/2 and f/11, the Zeiss 2/135 is razor-sharp, and although a little softer at the minimum f/22 aperture, resolution remains homogenous into the corners. In fact, all its lens metrics are great, with virtually no distortion nor chromatic aberration, and excellent transmission of 2TStop providing lots of light for the viewfinder. 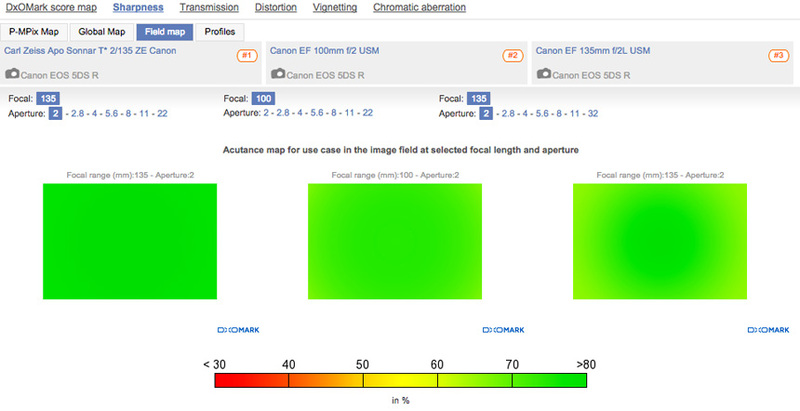 In second place, with a DxOMark score of 40 points, the $449 Canon EF 100mm f/2 USM is a great value for the money option. Sharpness is nowhere near as good as the Zeiss — achieving only 19 MPix, less than half the resolution — but it’s got great low-light credentials, thanks to its excellent 2.3TStop transmission and maximum f/2 aperture. At f/2 it isn’t quite as strong as the Zeiss, but still good considering the price, and very close to homogenous at this setting, too. Between apertures f/2.8 – f/11 it’s super-sharp edge-to-edge, and again softer at f/22 but still homogenous. In third place for 100–200mm telephoto primes is the $999 Canon EF 135mm f/2L USM, which is a good compromise between price and sharpness. Although boasting similar lens metrics to our other top two telephoto primes, the EF 135mm f/2L isn’t quite as sharp at f/2, with more resolution drop in the corners at this maximum aperture setting. The EF 135mm f/2L is strong between f/2.8 and f/11, however, and is actually as sharp at its minimum aperture of f/32 as the Zeiss is at f/22 — important to know if you’re after the best long depth-of-field on a 135mm prime. The 300mm, 400mm, 500mm & 600mm telephoto primes are workhorse lenses for professional wildlife, sports, or celebrity photographers. Boasting fast maximum apertures of either f/2.8 or f/4, not to mention some of the sharpest results on the 5DS R, these lenses are big, heavy, and expensive. If you need to get really close to your subject at the same time achieving fast shutter speeds in poor light, however, these are the lenses you need. 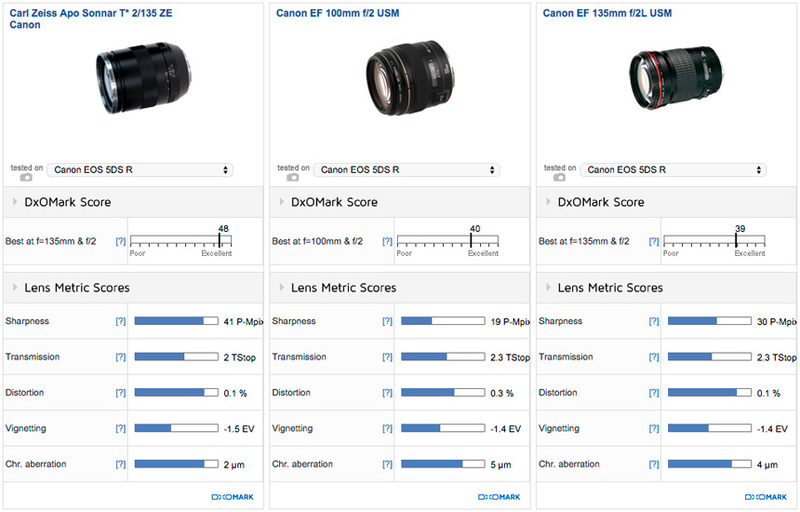 We’ve tested seven long telephoto prime lenses on the 5DS R with scores ranging from a high of 38 points for the Canon EF 400mm f/2.8L IS II USM to a low of 23 points for the Canon EF 300mm f/4L IS USM. 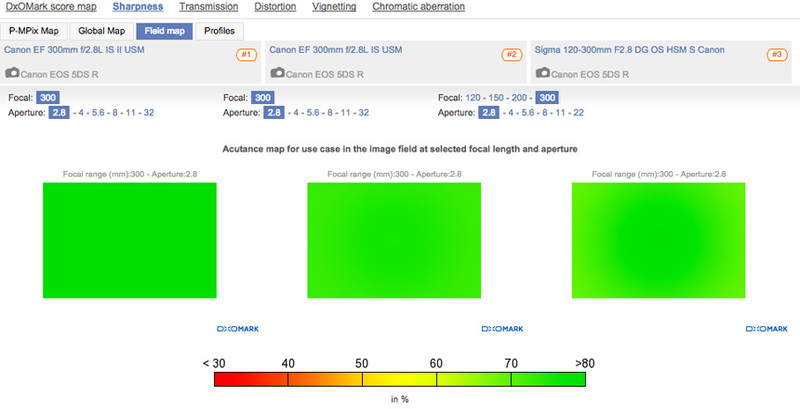 The top three lenses in this category feature similar lens metrics with the exception of sharpness. They all boast good light transmission scores of just over 3TStop, which is excellent considering the glass involved to facilitate these long focal lengths, as well as helping photographers with a brighter viewfinder, faster shutter speeds, and quicker autofocus when shooting moving subjects. In terms of sharpness, the top three telephoto primes offer homogenous resolution at all aperture settings, with the sharpest results between f/2.8 and f/11. At the crucial aperture setting of f/2.8, while both Canon 300mm versions (Mark I and Mark II) offer excellent edge-to-edge resolution, the Mark II is just a little bit sharper overall. 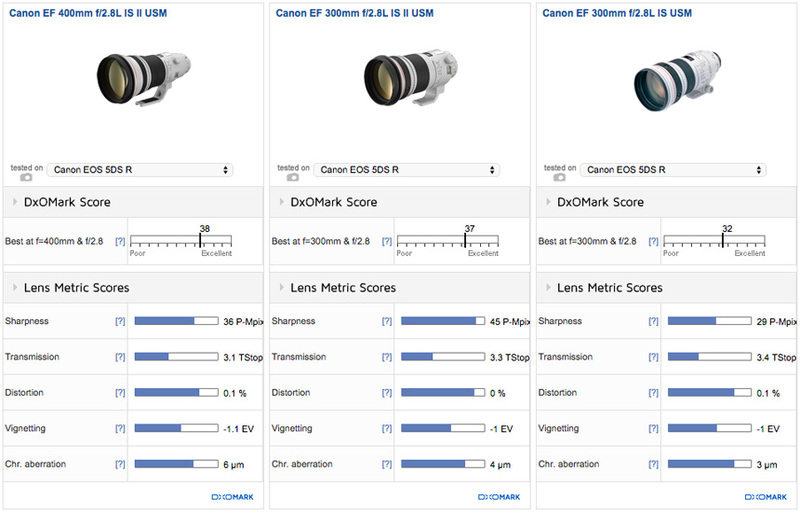 In fact, with a sharpness score of 45-PMpix, the Canon EF 300mm f/2.8L IS II USM ranks as the sharpest lens we’ve tested on the EOS 5DS R.
If your budget doesn’t stretch to $6,099 for the new 300mm Mark II version, however, picking up a good-condition Mark I on the second-hand market is an attractive alternative. If you need a slightly longer focal length for particular sport or wildlife subjects, the $9,999 400mm f/2.8 is the longest focal length f/2.8 aperture lens commonly available, which makes it a popular lens, particularly with football/soccer photographers. With similar lens metrics to the 300mm versions and excellent overall image quality, Canon’s EF 400mm f/2.8L IS II USM is our top-ranked telephoto prime lens on the EOS 5DS R, just nudging out the Canon EF 300mm f/2.8L IS II USM (38 points to 37). 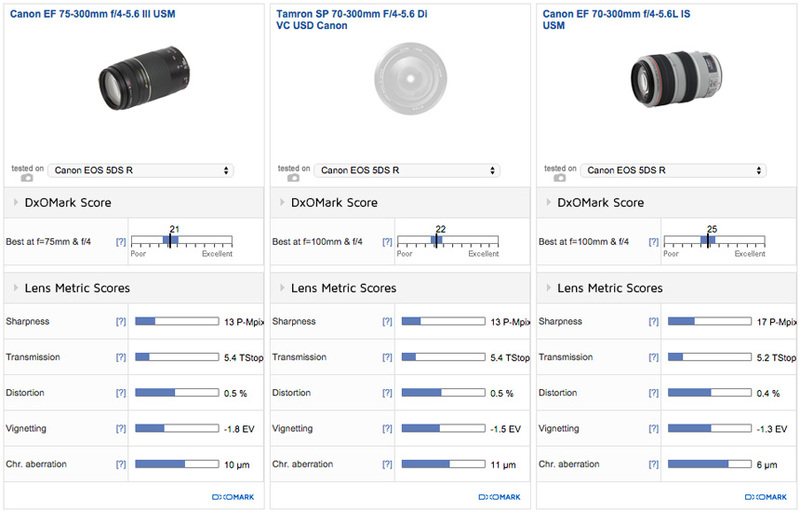 If you need even longer focal lengths, keep in mind that all three of these top telephoto primes are compatible with Canon’s Extender EF III teleconverters. 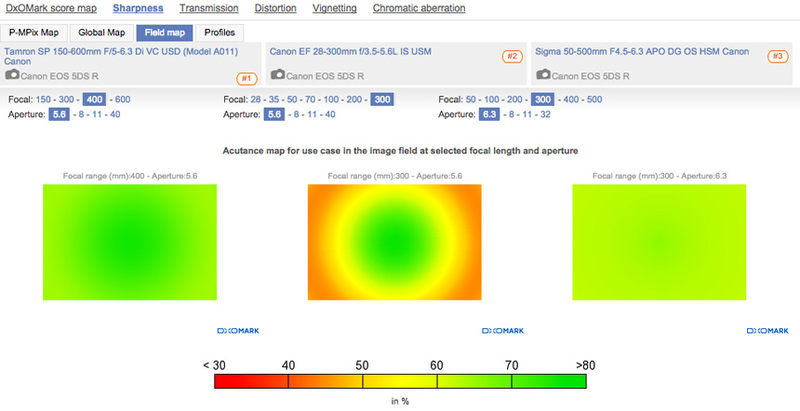 With either the 1.4x or 2.0x teleconverters available, focal lengths increase to 420/560mm at f/4 with the EF 1.4x III, or 600mm/800mm at f/5.6 with the EF 2.0x III. 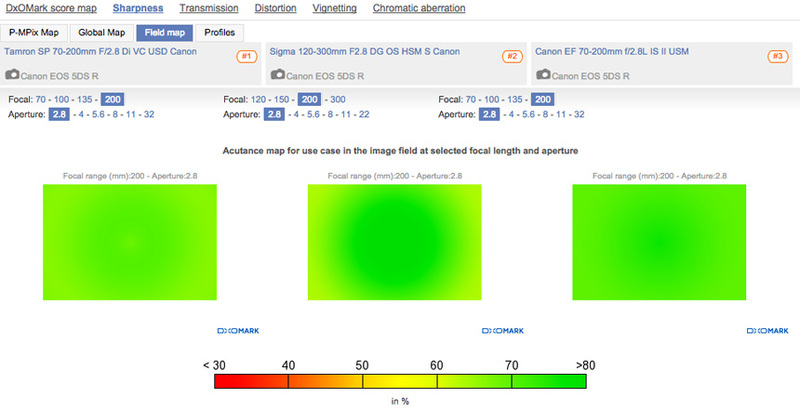 Full autofocus performance remains using these long telephoto prime lenses with Canon EF III teleconverters on the EOS 5DS R, too. “Fast” telephoto zoom lenses keep a large maximum aperture fixed through the focal range. In order to keep the size, weight and price of such lenses down, these lenses don’t commonly offer focal lengths over 200mm, with the typical “fast” aperture telephoto zoom for full-frame cameras being 70–200mm. This makes them a versatile option for lots of subjects, including events, weddings and portraits, as well as some sports and wildlife shooting when you’re not too far away from the subject. That said, there are a few notable exceptions that we’ve included in this category, including the Sigma 120-300mm f/2.8 and the Canon EF 200-400mm f/4, both of which zoom past 200mm while keeping the fast fixed aperture. 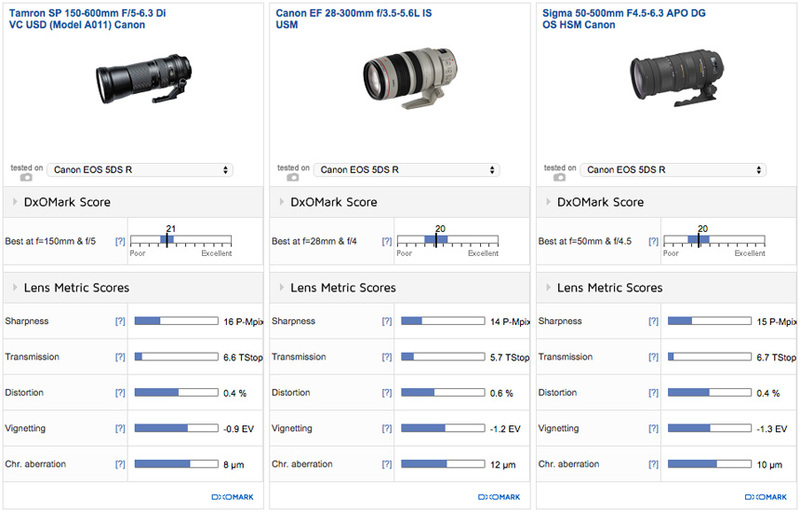 We’ve tested ten fast aperture telephoto zooms on the 5DS R with scores ranging from a high of 35 points for the Tamron SP 70-200mm f/2.8 Di VC USD to a low of 26 points for the Sigma 70-200mm f/2.8 EX DG APO HSM. The third-party, $1499 Tamron SP 70-200mm f/2.8 Di VC USD and Canon’s own $1999 EF 70-200mm f/2.8L IS II USM are both in our top 3, and offer similar features including Image Stabilization, a built-in autofocus motor, and top image quality. 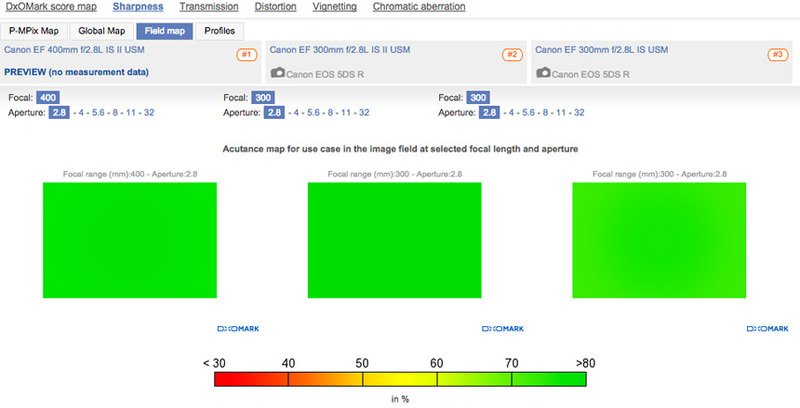 Lens metrics are pretty similar, too, with the Canon just edging it for vignetting and chromatic aberration, and the Tamron ahead for sharpness, transmission and distortion, but not by much. At the maximum f/2.8 aperture, the Tamron is both homogenous and razor-sharp at 70/100mm, but drops off a bit compared to the Canon at 135/200mm. 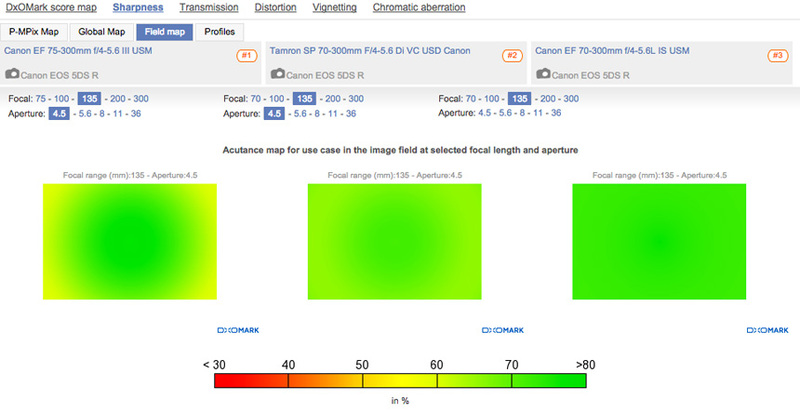 If you’re planning to shoot a lot at 200mm f/2.8, the Canon 70-200mm f/2.8L IS II USM has the edge. At the same 200mm f/2.8 setting the Sigma 120–300mm isn’t quite as good, with some edge softness creeping in, despite being very sharp in the center. This is an inherent problem of building a telephoto zoom covering a large focal range such as 120–300mm: it’s difficult for it to be optically excellent at both ends of the zoom. In the case of the Sigma 120-300mm, it’s the wider end that suffers, with some edge softness noticeable between 120 and 200mm at f/2.8. It excels at 300mm f/2.8, however, with results almost as sharp as the dedicated Canon 300mm f/2.8 prime previously discussed. What’s more, the Sigma 120-300mm offers better light transmission than the Canon 300mm prime, as well as comparable distortion and vignetting, but weighing in at nearly 3 kg, it’s around 20% heavier, too. “Slow” telephoto zoom lenses offer smaller maximum apertures around f/4 at the wide end of the focal range, stopping down one stop to f/5.6 at the long end of the zoom. The advantage of this variable aperture system is that manufacturers can make these slow telephoto lenses smaller, lighter and significantly cheaper than their “fast” aperture counterparts. This makes them a popular choice with many enthusiast photographers taking a first foray into long-focal-length photography. These slower aperture telephoto zooms also commonly offer a greater 300mm maximum focal length, allowing you to zoom in even further. Look out for features such as Image Stabilization that help you achieve sharper shots using slower shutter speeds. This is particularly useful for shooting relatively static subjects on these slow aperture telephoto lenses, but doesn’t really help if you need to freeze fast action such as with sports or wildlife photography. 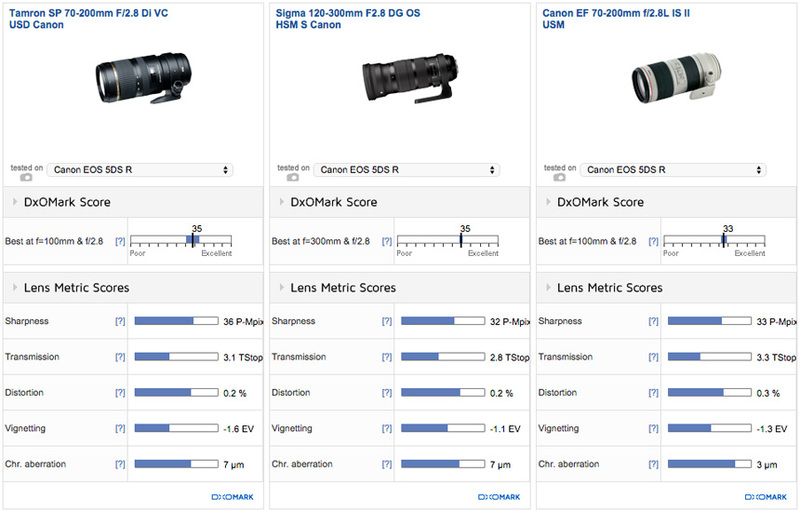 We’ve tested 13 slow aperture telephoto zoom lenses with scores ranging from a high of 25 points for the Canon EF 70-300mm f/4-5.6L IS USM to a low of 17 points for the Canon EF 70-300mm f/4-5.6 IS USM. 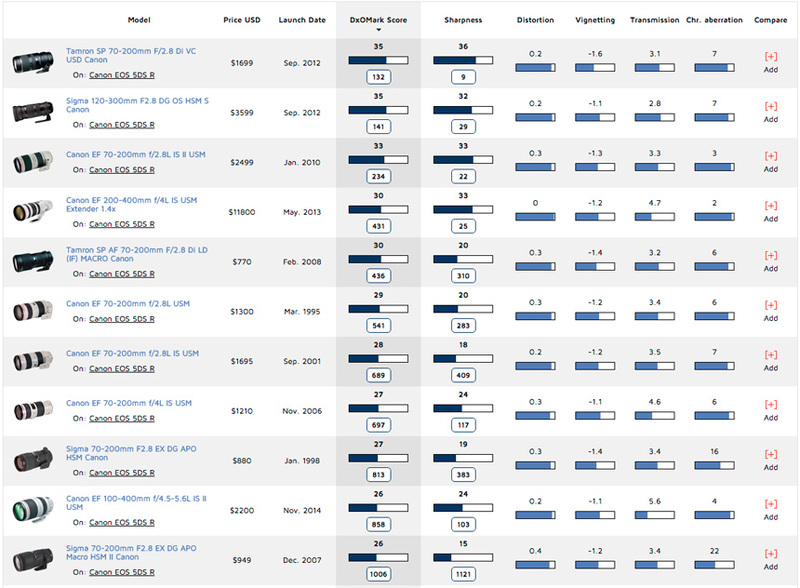 As you can see the top three performing slow telephoto zooms on the Canon 5DS R — the $1,249 Canon EF 70-300mm f/4-5.6L IS USM, the $449 Tamron SP 70-300mm f/4-5.6 Di VC USD, and the $179 Canon EF 75-300mm f/4-5.6 III USM — all have significantly lower DxOMark scores compared to the more expensive fast telephoto zoom lens equivalents. Sitting in Canon’s L range of professional-grade lenses, the Canon EF 70-300mm f/4-5.6L IS USM offers improved sharpness of 17 P-Mpix, compared to 13 P-Mpix clocked up by the cheaper rivals in the top three. 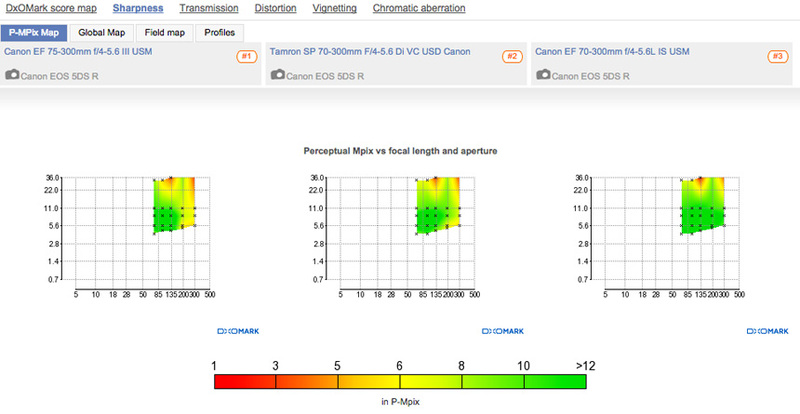 Bear in mind though, at $1,249, it’s not significantly cheaper than the $1,499 Tamron SP 70-200 f/2.8 fast-aperture telephoto lens previously discussed, which boasts a significantly better sharpness score of 36 P-Mpix. At f/5.6, the $179 Canon EF 75-300mm is only homogenously sharp at 75mm, with edge softness apparent between 100 and 300mm at the maximum aperture. 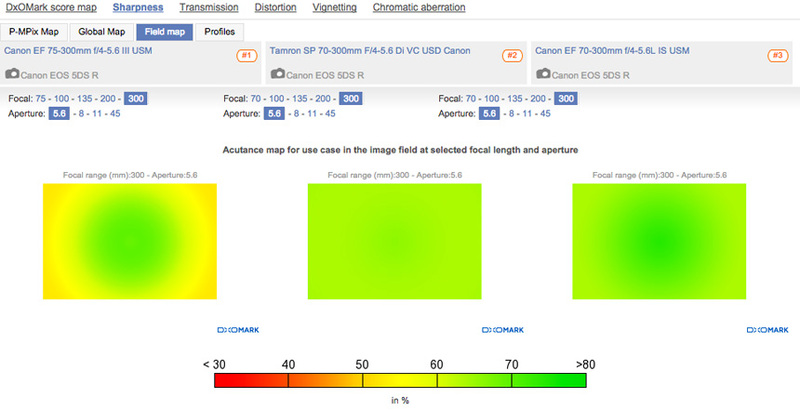 At the same aperture, the Tamron 70-300 performs better at the longer focal lengths, so while some edge softness is noted at 70mm, it’s homogenous between 100 and 300mm, with the sharpest overall results recorded between 100 and 200mm. The best results at f/5.6 are clearly from the Canon L series 70-300mm, which offers excellent sharpness between 75-135mm; and while a little edge softness occurs between 200 and 300mm, it’s better than the Tamron at the edges and sharper in the center, too. 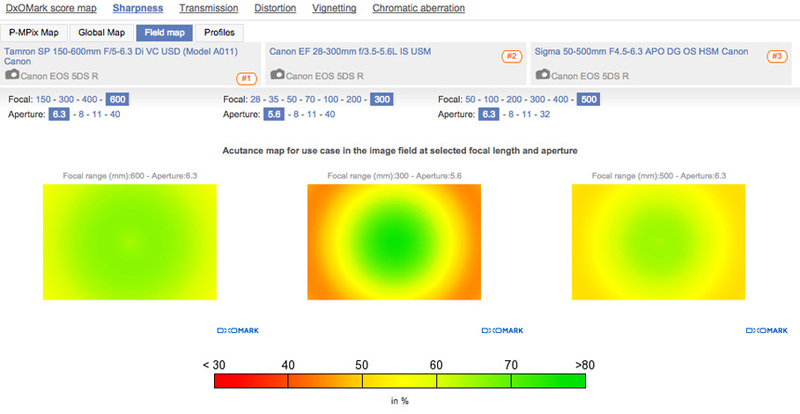 A final thing to note is light transmission, which becomes an issue on these slow-aperture zoom lenses. While there’s little difference between the top three in this regard — they all average around 5.4 TStop — this lower transmission means there will be less light for the viewfinder and autofocus sensors, which will affect performance, especially in low light. For the purposes of this review, we’ve classed super-zoom lenses as either wide-angle through to long telephoto focal lengths, such as 28-300mm, or short telephoto to super telephoto, such as a 50–500mm lens. We’ve tested six super-zoom lenses on the 5DS R with scores ranging from a high of 21 points for the Tamron SP 150-600mm f/5.6-6.3 Di VC USD, to a low of 17 points for the Sigma 50-500mm f/4-6.3 APO EX DG. 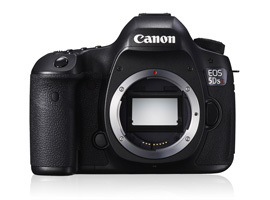 If it’s the traditional super-zoom option, offering a wide-angle through to long telephoto focal length, you’re after for the 5DS R, then the Canon L series EF 28-300mm f/3.5-5.6L IS USM is the one to go for. Costing $2,449 it’s not cheap, especially compared to its $849 Tamron AF 28-300mm f/3.5-6.3 XR Di VC LD rival, but the pro-grade Canon option offers better lens metrics in everything excepting vignetting. This includes sharpness, where 14 P-Mpix for the Canon compared to 10 P-Mpix for the Tamron is significant, and the EF 28-300mm f/3.5-5.6L boasts a slightly faster maximum aperture at the long end of the zoom, too. 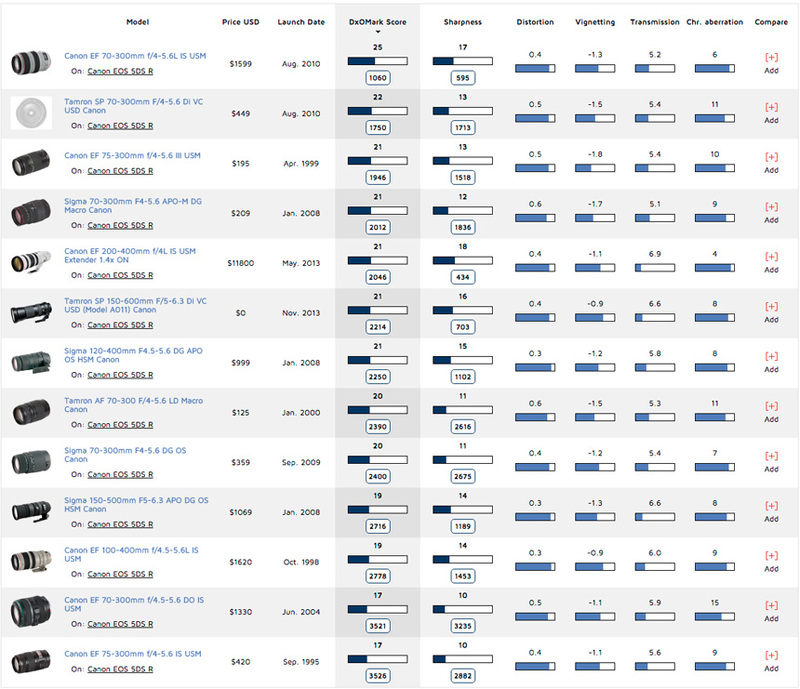 Super-zooms offering the long telephoto focal length of 500 or 600mm include the $1069 Tamron SP 150-600mm f/5-6.3 Di VC USD and the $1509 Sigma 50-500mm f/4.5-6.3 APO DG OS HSM. With slow variable apertures on both, it’s a bonus that they also feature image stabilization, which will help when shooting certain subjects at the long end of the zoom in bad light. While the Sigma has the greatest overall focal range (a 10x zoom at 50 to 500mm), the Tamron extends a little further with a maximum 600mm focal length. With neither lens offering good light transmission of 6.6 or 6.7 TStop, expect relatively dark viewfinders and unresponsive autofocus when using these lenses in anything except good light. In terms of sharpness, the Tamron 150-600mm just gets the nod ahead of the Sigma 50-500mm, scoring 16 P-Mpix compared to 15 P-Mpix, and it performs marginally better at 600mm compared to the Sigma at 500mm, too.